This is a concern of mine at school. When I hear of all the junk food that schools are selling to children it infuriates me. Teachers complain about students behavior but meanwhile the school is selling sugar filled junk to the kids at lunchtime. Many kids are getting too much sugar in their breakfast cereal and then getting more at lunch. They get wired up and that is when teachers complain about their behavior. It is a vicious circle. I mentioned to my children’s school last year that they should sell healthy snacks instead of the junk they sell. I was told that they tried that a couple years back (before we attended) and parents were calling to complain. They said that their children were coming home complaining. They asked the school to bring the junk food back. Makes me wonder about the mental stability of these mothers. There are some schools out there that are trying but most just don’t care. Here is one article I found on the subject. Through contracts with soft drink companies and other vendors, some schools are raising as much as $100,000 a year, money that pays for such things as computer rewiring, teacher training and Black History Month activities. Read the fine print of those contracts, though, and the costs start to sink in: One school in Prince George’s County guaranteed sales of 4,500 cases of soda a year — or about 50 sodas a student. Some contracts state that schools could lose money if they turn off the machines at lunchtime, as required by state and federal law. The biggest cost, some parents and health advocates say, is the health risk to students in a system that gives schools a financial interest in selling them more snacks. The U.S. Agriculture Department delivered a stinging report to Congress last month recommending that all snacks sold in schools meet the federal government’s nutritional standards. “One of the biggest challenges school meal program managers face is the competition with foods that are marketed to children through multimillion-dollar, glitzy and sophisticated advertising campaigns,” the report stated. The explosion of vending machines in public schools is a relatively new phenomenon. As recently as a decade ago, such machines were uncommon on campus. But as principals and PTAs began to recognize the potential payoff of vending revenue during a time of increasingly tight school budgets, the number grew quickly. Increasingly, school districts are signing exclusive deals with one soda company or vendor. Charles County, for instance, signed a 10-year, $1.75 million deal last year to sell only Coke products in its schools. Some communities, though, have fought against the proliferation of snack machines in schools. In Philadelphia last year, parent activists successfully blocked a proposed 10-year, $43 million deal between the school system and Coca-Cola. Last week, the New York Board of Education settled a 1999 class-action lawsuit brought by parents. An agreement was reached that schools can sell only nutritious snacks during lunch hour. In exchange, Blair promised to place a minimum of 18 soft drink machines throughout the school and ensure that the student population remained above 2,100. The machines are on all day, despite a federal law prohibiting schools from selling such products during lunch hours and a Maryland law prohibiting schools from turning on vending machines until after the final lunch period. To many parents, the vending machine contracts are a necessary evil. But these are the parents who are clueless about the importance of diet as it relates to health. If your children are anything like mine they are tired of getting the same lunch everyday. My son decided that now after 5 years of school he does not like turkey. He only wants me to pack him salami. I buy the Applegate Farms salami in the package every week and he will eat through it by thursday. I need to find something else to give him because I know all that pork is not good for him. My daughter says she doesn’t like sandwiches. I have been trying to come up with ideas to give her something with enough protein. They ask me why they can’t have a lunch like all the other kids so I tell them that I don’t think like the other kids moms. ( It would have to be a cold day in hell before I send my kids to school with wonder bread and bologna) I have been searching around for ideas of different healthy lunches and found these ideas. Maybe some of them will work for you too. Most of these are add ins but you get the idea. Wraps made with whole wheat tortillas, containing either lean cold cuts Even the classic PB and J (peanut butter & jelly) is healthier in a wheat wrap. Single portion-sized cups of unsweetened apple sauce or fruit without added sugar. Individual serving-sized packages of low fat yogurt, cottage cheese, or yogurt smoothies. Mini-burritos made with rice and black beans or refried beans in a tortilla with tomato salsa. These can be heated or eaten cold. Baked chips or pretzels are a better choice than high-fat potato chips or cheese snacks. Whole grain bagels topped with cream cheese-vegetable spread. Dried cranberries or cherries are a sweet alternative for kids bored with raisins. Let us know what your children like in their lunches. We are all up for ideas. I was watching on Friday a little of Jamie Oliver’s Food Revolution. I really like that he talked about Lunchables. It seems that parents use Lunchables as an easy and fast way to feed their kids. I have always had a problem with this products, I think they are just disgusting. My kids still ask for them even though I have never bought them and I tell them its inedible. I know I might offend some but I think that Lunchables are lazy moms food. I looked up the nutrition information for Lunchables and its not pretty. There is 330 calories and 9g of saturated fat in 1 box. I don’t think this is even enough food for a child at lunch and you are already looking at this much fat and calories. From what I have seen most parents add in a “snack” along with these Lunchables. With a snack (usually junk food) you are looking at probably an additional 300 calories not to mention the fat and sodium. 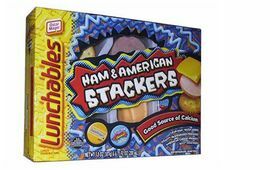 These Lunchables are really a poor excuse for lunch for a child. I have seen an organic version at Whole foods but have not really looked into the content and calories in them. Let me know your thoughts, has anyone tried or looked into the Wholefoods version or any other?